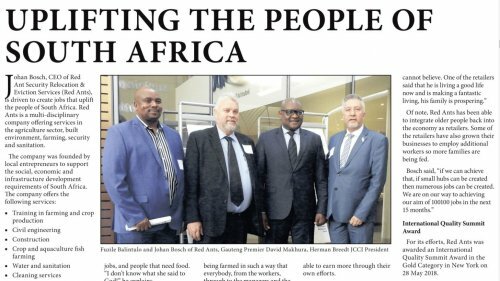 Johan Bosch, CEO of Red Ant Security Relocation & Eviction Services (Red Ants), is driven to create jobs that uplift the people of South Africa. Red Ants is a multi-disciplinary company offering services in the agriculture sector, built environment, farming, security and sanitation. The company was founded by local entrepreneurs to support the social, economic and infrastructure development requirements of South Africa. Bosch started the agri-park component after recovering from a life-threatening illness. He explained that his wife, who is religious, said that he could not die as there were people that need jobs, and people that need food. "I don't know what she said to God!" he explains. He added, "It is important to ask what we can do to uplift the people that are around us. If we don't, we are going no-where." The agri-park was started by training people, regardless of age or literacy levels, from the Eikenhof Johannesburg area. Today the agri-park is run by managers who were previously trained there. In addition, after listening to, and identifying the needs of the workers, Bosch came up with a plan to upgrade everybody. He commented, "The agri-park is being farmed in such a way that everybody, from the workers, through to the managers and the directors, whoever is participating in the park, participate in profit sharing." As a result of this model, productivity has increased. "Productivity went up as people are working for themselves, not just for someone else. They know that the more they produce, the more they take home and the more their families grow." Bosch explained further that this model is significant as rather than just having continual calls for higher salaries, people should be given the opportunity to be able to earn more through their own efforts. "I think that the message we must try and get into South Africa is that through productivity and training you can achieve at a much higher level." He added, "Let's work with each other, let's be one race, let's be one nationality, let's be one big family. At Red farms we are one big family and we stick together through thick and thin." Further to profit sharing, the agri-park has created its own markets by establishing vendors in the township economy. "We supply them with produce and these people are selling like you cannot believe. One of the retailers said that he is living a good life now and is making a fantastic living, his family is prospering." Of note, Red Ants has been able to integrate older people back into the economy as retailers. Some of the retailers have also grown their businesses to employ additional workers so more families are being fed. Bosch said, "if we can achieve that, if small hubs can be created then numerous jobs can be created. We are on our way to achieving our aim of 100100 jobs in the next 15 months." For its efforts, Red Ants was awarded an International Quality Summit Award in the Gold Category in New York on 28 May 2018. For the last 32 years Business Initiative Directions (BID), led by Jose E. Prieto and a group of qualified professionals from the academic world and from business and engineering sectors, has been committed to recognising, educating and spreading Quality Culture around the world. The BID Quality Award received by Herman Breedt, Red Ants Director symbolises "international recognition of leadership in Quality of Red Ant Security Relocation & Eviction Services, for following the path to continuous quality improvement."